WHEN YOU DON’T HAVE THE TIME TO MAKE DECADENT COOKIES MAKE THESE EASY LAZY BARS INSTEAD. 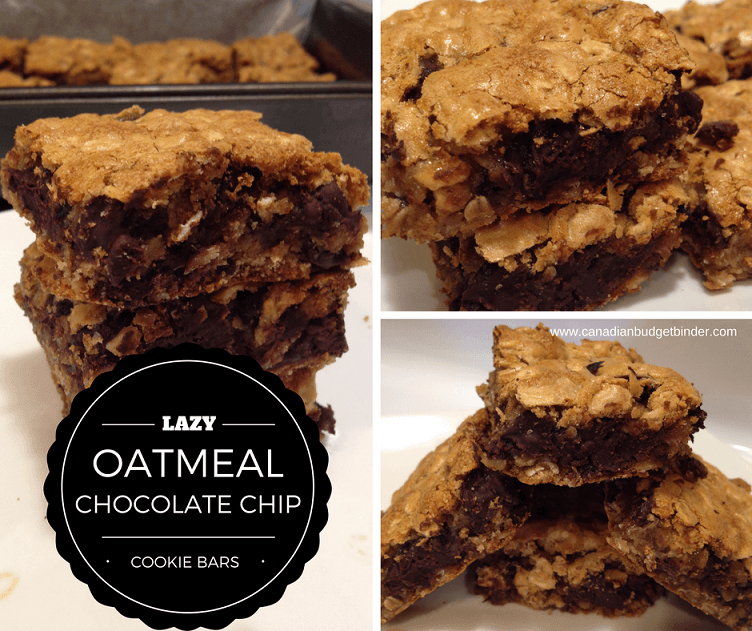 The day these Lazy Oatmeal Chocolate Chip Cookie Bars were created it was raining outside and all I wanted to do was relax after a long day of work. Instead I divided my time between the couch and the kitchen because I wasn’t going down without a sweet-tooth fix that night. What happens when you take homemade oatmeal cookies and the best chocolate chip cookies and mix them together? You get an amazing oatmeal chocolate chip cookie. But, you’re not in the mood to scoop, roll and press cookies because you want to spend your evening in front of the television watching your favourite movie cuddled with a blanket, glass of milk and something sweet. Time to get lazy in the kitchen and I don’t mean open a bag of Oreos and retire to the couch. In a round-a-bout way this is how my Lazy Oatmeal Chocolate Chip Cookie Bars came together without mentioning the disaster our son made. Having a toddler in the house means there is little time to be making cookies when all he wants is my attention. I combined my traditional oatmeal raisin cookies without the raisins and Chocolate chip cookie dough brownies without the brownie to create the best oatmeal chocolate chip cookie bars. When you look at the Lazy Oatmeal Chocolate Chip Cookie Bars you better believe that’s one huge layer of chocolate right through the centre of the bar. 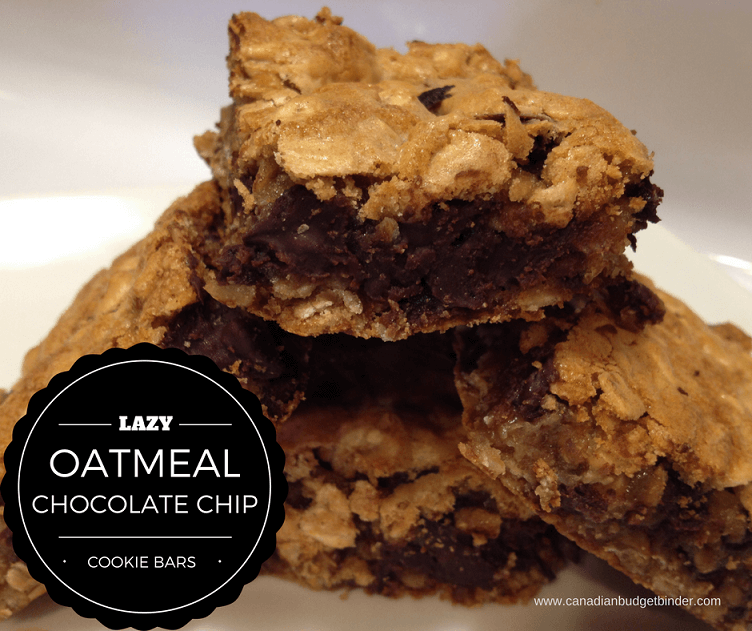 The Lazy Chocolate Chip Oatmeal Cookie Bars are soft, chewy and will satisfy your sweet craving. But, that’s not all. If you’re too busy to bake cookies for the bake sale, Christmas cookie exchange or need a quick treat to bring to a dinner party, this is an easy recipe that won’t fail. I used a 9x 13 baking pan that I sprayed with a bit of cooking spray and then lined it with parchment paper with overhangs. The reason for this is so I can easily take the Oatmeal Chocolate Chip Bars out from the pan once they are cooled. I’ve had too much of a fuss in the past without using parchment paper any time I make bars or squares that I always keep it in stock. Another quick tip is to never over-bake any type of cookies whether they are shaped as a bar or square. I always under-bake my cookies by a few minutes to make sure I end up with a soft chewy centre. You’ll find with these Oatmeal Chocolate Chip Cookie Bars that your centre will be full of chocolate as the chocolate chips meld together. Even though I layer the chocolate chips they seem to find a way to magically layer in the middle. This recipe makes 12 large squares or 24 smaller oatmeal chocolate chip cookie bars. You can freeze them up to 3 months in an air-tight container but they likely won’t even see the freezer. Optimally if you know you have to bake ahead of time you can store them in the freezer and transport them from frozen to your event. If you’d like to add a layer of melted chocolate over the top of the Oatmeal Chocolate Chip Cookie Bars all you need to do is wait until they cool and then pour melted chocolate over. Let the bars freeze and then cut into squares. You can also add coconut on top of that chocolate layer, chopped nuts or even raisins. 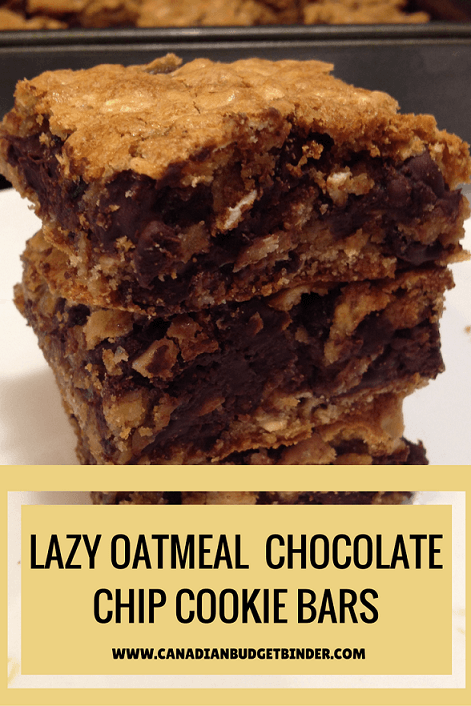 Lazy Oatmeal Chocolate Chip Cookie Bars are great to bake when you're not in the mood for making cookies but still want your sweet tooth fix. They are also great for bake sales, dinner parties, holidays etc. as they are easy to make and transport. Take a 9x13 baking pan and give it a quick spray with cooking spray and then line with parchment paper so there are overhangs on all sides. in a stand mixer or large bowl add your butter, brown sugar, white sugar, salt and vanilla, Mix together for about a minute then add your eggs. Mix again for another minute or until combined and fluffy. Add your dry ingredients, flour, oats, baking soda, baking powder, cinnamon and mix. Spread half the mixture into the baking pan, top with 1 cup of chocolate chips, add the remainder of the batter and add the rest of the chocolate chips. With your hands or the back of a large wooden spoon press the batter tightly into the pan making sure you reach all of the corners to have uniform bars. Bake in the oven for 22-25 minutes but don't over-bake. If they start to turn golden brown they are done. Lift the parchment paper out and set on cutting board. Cut 12 large bars or 24 small bars all uniform in size. If they aren't it's not a big deal but if you want them to be perfect you can do it this way. 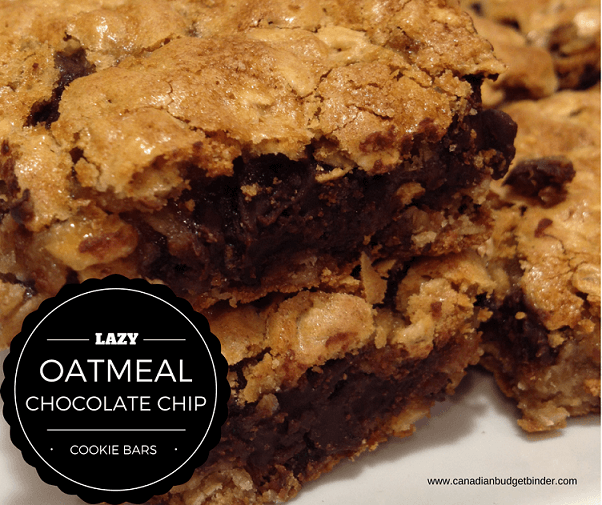 Lazy Oatmeal Chocolate Chip Cookie Bars are simply two recipes in one without all the fuss and mess in the kitchen. Enjoy with a large glass of cold milk. I like to freeze the bars first then eat them as they are coming to room temperature. This way you can just taste the hints of cinnamon paired with the chocolate and oatmeal. What are some of your favourite types of cookie bars?